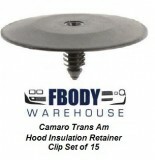 1974 1975 1976 1977 1978 Firebird and Trans Am hood insulation blankets are a great way to prevent heat from slowly baking the hood decals and parts. The engine bay puts off a lot of heat and hence without this blanket your bird is in the over so to speak. 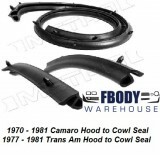 All Trans Am and Firebird hoods came standard pre-stamped for the hood insulation so even if yours did not come stock with one you can add one in no time at home! 1975 - 1976 Firebird Formula Hood Grills GM Nice!